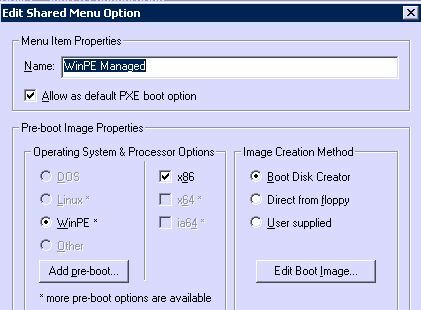 Have had a lot of questions lately on adding NIC drivers to an Altiris WinPE PXE image. There are probably a couple ways of doing this, but here’s what works for me. First, you need to download drivers from the vendor’s website if you don’t have them. Make sure you download the Vista drivers. In most installs this would be the 32-bit driver. Extract these drivers to a folder on your Altiris server. Copy the PROWin32.exe to the root of the C:\ Drive. Make a folder on this drive — I named mine Intel-NIC. Open a command prompt and cd\ to the C:\ drive. Type “PROWin32.exe /s /e /f C:\Intel-NIC” (without the quotes). This will extract the files into the Intel-NIC folder that you will navigate to later. 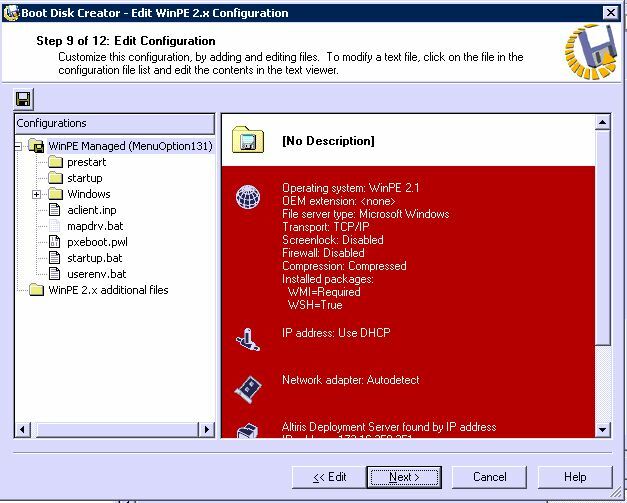 Once you have drivers downloaded, open up the Altiris deployment console. 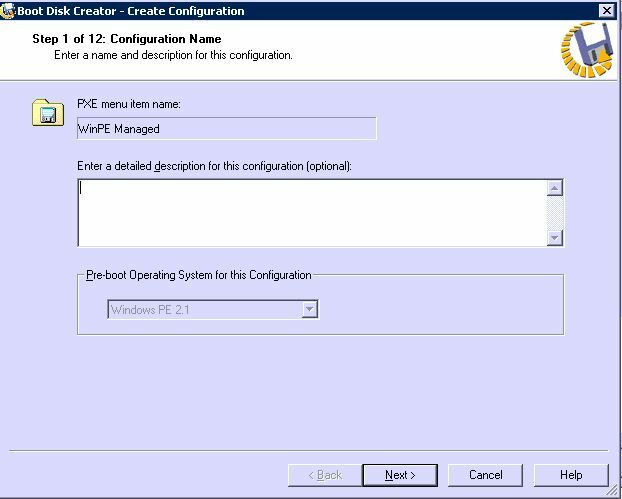 Click on the “PXE Configuration” icon located in the upper right part of the window. Next click on “WinPE Managed” and then the “Edit” button. 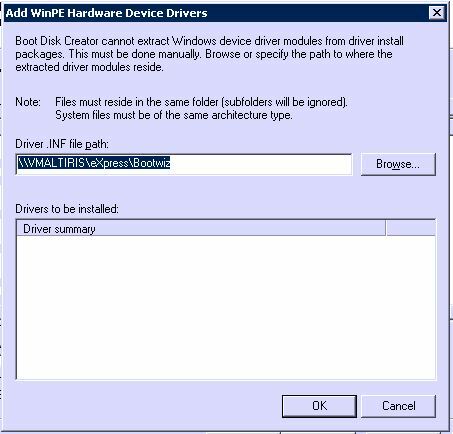 In the “Boot Disk Creator – Create Windows PE Configuration” window, deselect the “Auto-detect all Device Drivers” check box and then click on the “Have Disk…” command button. 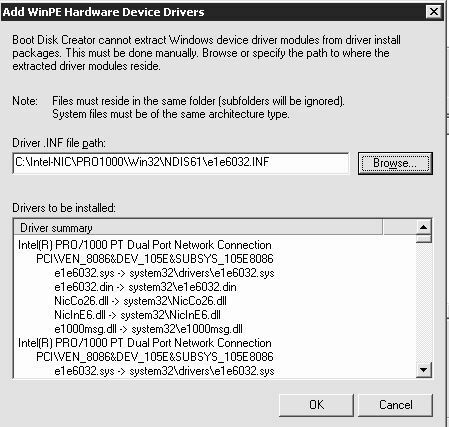 In the “Add WinPE Hardware Device Drivers” window, click on “Browse” to navigate to the folder where the extracted drivers are located. You will want to locate an *.inf file to upload. Each driver is a bit different, so you may need to navigate to a couple different folders to get the drivers you need. Once you locate the *.inf file, you will be presented with a window that lists the drivers that will be installed. Click “OK” to begin the process. 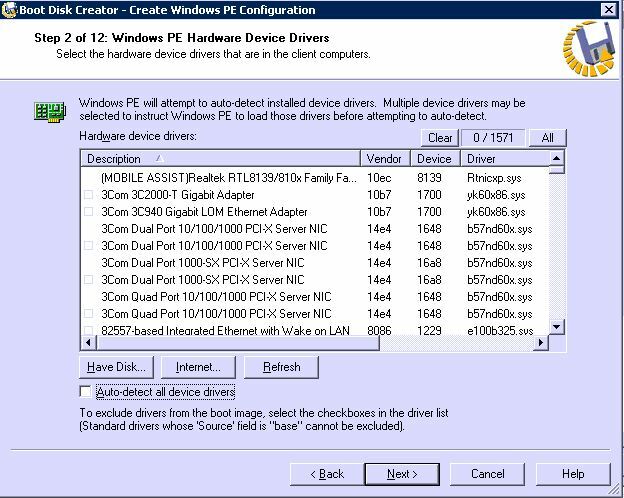 Select the “Auto-Detect Device Drivers” checkbox again if it was deselected and keep selecting “Next” taking the defaults until you start to build the pxe files. There will be several screens to click through. 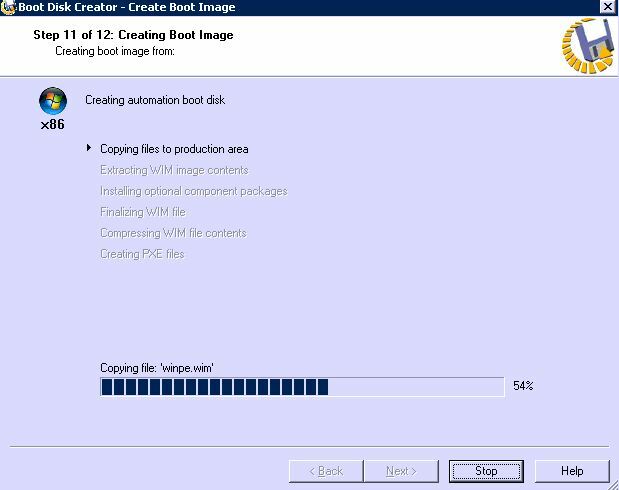 The final screen building the pxe image again is noted below. This will take several minutes to complete, so be patient and get a cup of coffee. That should do it and your WinPE should be good to go.